The layout of this vehicle was based on a design the customers had used twice previously in New Zealand. 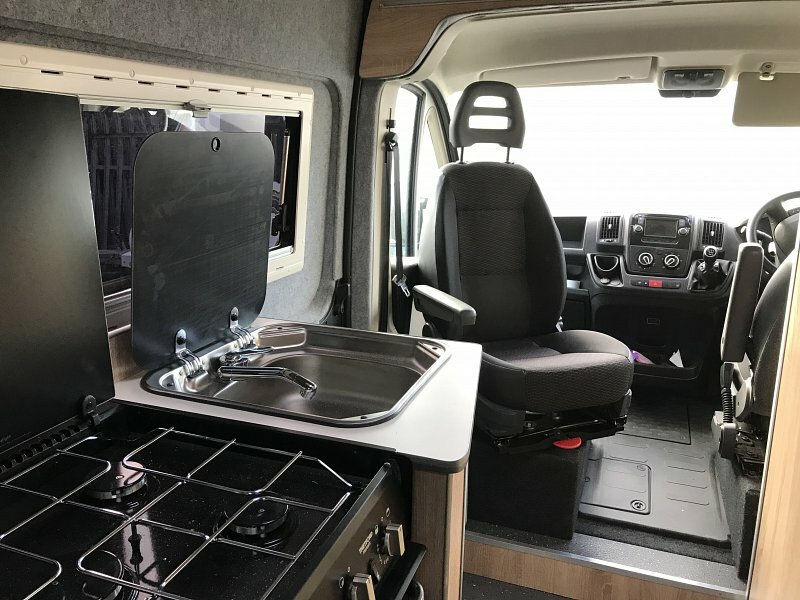 The light wood tones were chosen to keep an airy feel to the van and the end-lounge can be opened to extend the outside to the inside. The layout has a rear lounge / diner that converts in to a double bed. The shower room is at the front to separate the driving cab from the living area. The opposing bench seats make a dining area for two or a sociable seating area for up to four people. When the benches are converted to a bed at night time, the passenger cab seat swivels to give an extra chair. The bench seats have an easy-glide pull-out system that allows the cushions to be rearranged to form a 1.2m wide bed. The passenger cab seat remains as a useable chair in the living area if rotated in to the living area when the bed is made. The kitchen unit comprises an integrated hob and oven with a separate wash basin in the adjacent worktop. A microwave and fridge are opposite the kitchen unit. The utility area comprises an additional worktop above the fridge and wardrobe unit. The aerial connection point has been installed in this area to allow either a free-standing or wall mounted in this position for comfortable viewing from the lounge area. The washroom comprises a shower, fold-up sink and cassette toilet.